Through the nineteenth and twentieth century, Petticoat Lane market was one of the wonders of London, until deregulation in the eighties permitted shops across the capital to open and the market lost its monopoly on Sunday trading. 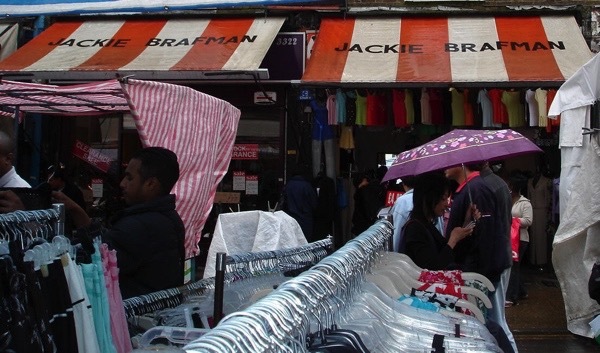 One of the most celebrated and popular traders was Jackie Brafman, still remembered for his distinctive auctioneering style, standing on a table in the Lane and selling dresses at rock bottom prices. 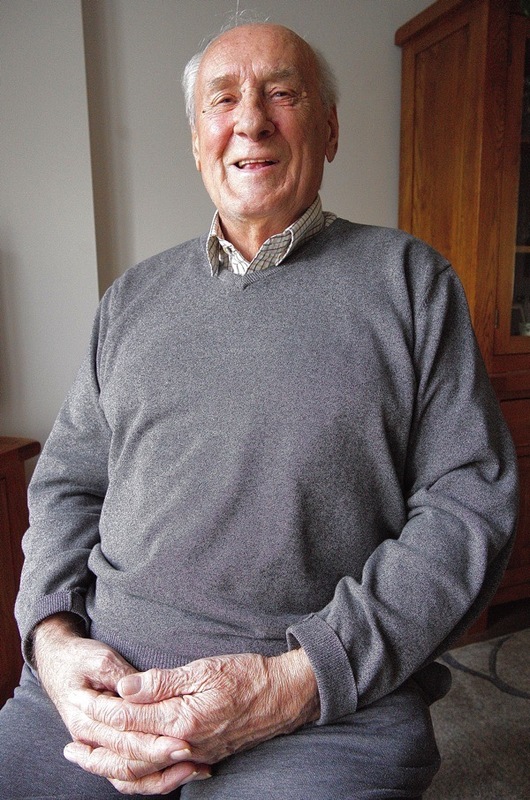 George Dickinson worked as Sales Manager for Jackie Brafman for thirty-three years during the heyday of the sixties, seventies and eighties. Losing his father when he was still a child and coming to London from Newcastle as a teenager, George discovered a new family in Petticoat Lane and a surrogate father in Jackie Brafman. “I was born as George Albert Dickinson in Heaton, Newcastle Upon Tyne, one of six brothers and a sister. We had a very good family life and we were happy until my father died when I was nine. In those days, they did not know whether it was cancer or tuberculosis. He was manager of a brewery and a very good piano player. He used to get behind the piano in the dining room and play the chords. My mother had to sell our four-bedroomed house and we moved in with an aunt. After three months, the aunt died and we had to get out again. We moved to a small terraced house in Scotswood, and my mother did cleaning and worked in a pub in the centre of Newcastle. Our neighbour was a retired miner and every month he got a ton of coal from the coal board. His wife used to come ask, ‘George, Would you like to shovel it into the coal hole? If anybody wants to buy some coal, it’s sixpence a bucket.’ I used to do that for her and she gave me a shilling. I lived there until I was fourteen when I was allowed to leave school and go to work because of the situation. My eldest brother became a fireman in Newcastle during the war and another was sent to Burma as a medic. There’s only me and my younger brother left now. I had two jobs in Newcastle. First in a bedding company, making divans, and then I had a go at French polishing, but I got the sack from that – why I do not know. So I went to try to get a job at a fifty shilling tailors and I think I lasted about two days, I did not like it at all. At fifteen years old, I decided to come to London. My sister met me at King’s Cross and took me to Camden Town. I was just mesmerised by it all. It was Irish and Greeks. A nice place to live at the time. She had a dairy in Pratt St and I lived with her for a little while. I got a job at a textile firm in the West End as a storeman and travelled back and forth by bus. Then I got my call-up papers at the age of eighteen in 1956. I did ten weeks training at Winchester Barracks and from there we flew from Luton airport to Singapore where we were given a week’s jungle training before being sent to a rubber plantation which was a base for an army camp. When I came out of the forces, I returned to the old firm but they went into liquidation, so I went to another firm which I did not like at all. I was walking around the West End and I bumped into a driver from a dress company, Peter. I had known him from the old firm. I said, ‘I’m looking for a job, Peter.’ He asked, ‘Do you mind what you do?’ I replied, ‘No, not at all.’ So he told me, ‘There’s a job going. It’s a Mr Brafman, he owns a place in Petticoat Lane.’ I did not know what Petticoat Lane was. Evidently it was a market but, coming from Newcastle, I did not have a clue. So I phoned him up, went down the same day for the interview and met him in the dress shop. He asked me, ‘What are you doing now?’ I explained who I had worked for and he must have phoned them up, because he told me, ‘Mr Flansburgh thought a lot of you.’ After that, he said, ‘When can you start?’ ‘Any time,’ I replied. ‘Start on Monday,’ he told me. Jackie Brafman was a terrific boss. At first, I did general things, sweeping and clearing up hangers. There were two shops, a small one which was retail and the large one was wholesale, full of stock. Over the course of time, I started selling in the wholesale department. Eventually, I met Mrs Brafman who was a pet lover. They bought two dogs and called them George & Albert after me. I built up a reputation as a good salesman and I never had to ask for a rise all the years I was there. If the boss was going to a boxing match, he always took me, even if it was Mohammed Ali. I was ringside with him when Cooper fought Ali and he split his glove. A very good man. He was like another father to me. He insisted I call him ‘Jack’ from the second week at work, so eventually I called him ‘JB.’ He did not mind that at all. On Sunday, he used to stand on a table and auction goods to the public in Petticoat Lane. I arranged for a special desk to be made that was big enough and strong enough to stand on. We had iron rails suspended above from the ceiling where we could hang dresses, a few of each in different sizes. I used to stand on a ladder and feed the clothes to him. I even picked up a bit of Yiddish, I could count the dress sizes in Yiddish. He would tell the customers he had sizes from ten to eighteen and they put their hands up, asking ‘Have you got a ten? Have you got a twelve?’ and I would be feeding the dress out to the crowd. On two occasions, he was in hospital so I got up and auctioneered. It was at Christmas time and we did very well. He was so well known and liked. There was another guy who used to come in and stand on the side of the shop, and I realised what he wanted. I asked, ‘Can I help you, Sir?’ and he said, ‘No, I’m waiting for one of the ladies to serve me.’ So I called, ‘Celia, Can you come and look after this gentleman?’ Eventually, I gained his trust and he showed me his photographs of him in dresses with wigs and makeup. He looked brilliant. He was a drag artist, but he did not want the lads to know. He used to spend a lot of money and only Celia could serve him. I became manager of the wholesale department, a double-fronted shop in Wentworth St, opposite the public toilets. People came from all over the world. Nigeria, Kenya, Ghana, Saudi Arabia and Arabia, as well as from all over this country. There were five girls working in the retail shop and we used to employ schoolkids to stand outside by the stall and make sure nothing got pinched. Jack would go to the West End and buy stuff from Clifton, which was very big fashion house for larger size women, and Peter Kay and Remark and Kidmark. These were all top names years ago. He would buy ‘over-makes’ from them. If they were given an order from Marks & Spencer for a thousand garments, they might make twelve hundred in case of any problems. Jack would buy the extra at a knock-down price. We might sell a dress for four-fifty retail and three-fifty wholesale, but Jack got them for seventy pence each. He done so well Jackie. Jackie’s father Maurice Brafman lived in Nightingale House, a home for the elderly.It was a beautiful place and he had his own room. The dining room was just like a hotel. He used to phone me up on a Friday morning and say, ‘George, Can you get me some groceries?’ I would go to Kossoff’s and buy cholla for him, and collect his kosher meat from the butcher. He did like his salami and occasionally a bit of fruit. I would put it all in a bag and, when I was going home, I would make a stop in Nightingale Lane to deliver his groceries. He would always check them and pick an argument about something. He would say, ‘You haven’t brought me so and so!’ and I would reply, ‘Mr Brafman, it’s in the bottom of the bag.’ ‘Alright,’ he would concede but he would always find fault. It was lovely seeing him. He lasted about five years there. 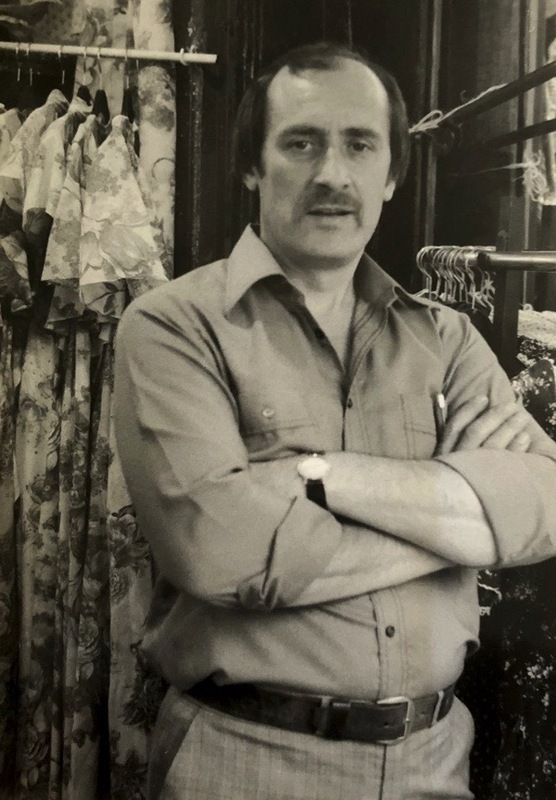 He had two sons and two daughters and eventually Mark, the eldest brother, opened clothes shops all over London called ‘Mark One.’ His wife caught him with another woman and took him for everything. He was worth a fortune and he had a house with a ballroom in the middle. The youngest son, David, went into the business in Petticoat Lane and closed the shop. What a fabulous history of life in Petticoat Lane. What a marvellous story this is! I love reading about the social history of the East End and the people who lived and breathed this place. Wonderful. I love these interviews that are full of life and spirit and take us back in time. This one is told by George with such gusto and generosity – great! Thank you George, wonderful memories. Great memories. George really brought Mr Brafman to life. I remember Mark One. There was one in Bolton. Fantastic raconteur! Thank you for bringing these people and events to life for us. A wonderful reminiscence. And wasn’t Jackie Brafman the inspiration for the market trader Madam Rita in A Kid For Two Farthings (played by Sid Tafler in the film). I seem to remember that glorious Yiddisher Dior line in the film.